Background: Advances in big data analytics can enable more effective and efficient research processes, with important implications for aging research. Translating these new potentialities to research outcomes, however, remains a challenge, as exponentially increasing big data availability is yet to translate into a commensurate era of ‘big knowledge,’ or exponential increases in biomedical breakthroughs. Some argue that big data analytics heralds a new era associated with the ‘end of theory.’ According to this perspective, correlation supersedes causation, and science will ultimately advance without theory and hypotheses testing. On the other hand, others argue that theory cannot be subordinate to data, no matter how comprehensive data coverage may ultimately become. Objective: Given these two tensions, namely (i) between exponential increases in data that have not translated into exponential increases in biomedical research outputs; and (ii) between the promise of comprehensive data coverage and inductive data-driven modes of enquiry versus theory-driven deductive modes, this critical review seeks to offer useful perspectives of big data analytics and to derive certain theoretical implications for aging research. Method: This work offers a critical review of theory and literature relating big data to aging research. 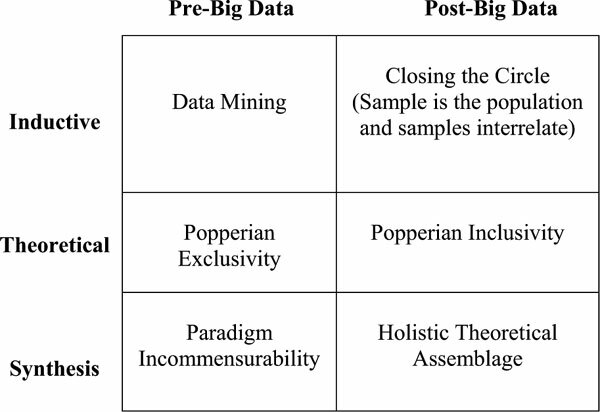 Result: The rise of big data provides important insights into the theory development process itself, highlighting potential for holistic theoretical assemblage to ultimately enable near real time research capability. Conclusion: Big data may represent a new paradigm of aging research that can dramatically increase the rate of scientific breakthroughs, but innovative theory development remains key to this potential. Keywords: Big data, technological change, aging research, probabilistic innovation, knowledge, exponential increases. Keywords:Big data, technological change, aging research, probabilistic innovation, knowledge, exponential increases. Abstract:Background: Advances in big data analytics can enable more effective and efficient research processes, with important implications for aging research. Translating these new potentialities to research outcomes, however, remains a challenge, as exponentially increasing big data availability is yet to translate into a commensurate era of ‘big knowledge,’ or exponential increases in biomedical breakthroughs. Some argue that big data analytics heralds a new era associated with the ‘end of theory.’ According to this perspective, correlation supersedes causation, and science will ultimately advance without theory and hypotheses testing. On the other hand, others argue that theory cannot be subordinate to data, no matter how comprehensive data coverage may ultimately become.